Ann Arbor planning commission meeting (March 6, 2012): Site plans for two food chains – a Tim Hortons at State and Ellsworth, and Noodles & Co. on West Stadium Boulevard, south of Liberty – were recommended for approval at the most recent planning commission meeting. Much of the discussion about the Tim Hortons site focused on a proposed roundabout at that intersection. Though the coffee and donut shop will likely be built by late summer – about a year before the roundabout is expected to be in place – a spokesman for the company said they’ll be designing the site with the roundabout in mind. Commissioners also recommended approval of a new AAA branch on South Main, across from Michigan Stadium. The plan calls for rezoning a portion of the site to accommodate more parking than the current office zoning would allow – a total of 35 spaces. That’s a reduction from the amount of parking currently on the site, which was approved in the mid-1970s, but it no longer conforms with existing zoning. Commissioners Bonnie Bona, Erica Briggs and Kirk Westphal expressed concerns about rezoning an area along Main Street for parking. They also wondered whether 35 spaces were necessary, especially when there are alternative parking options – at a park-and-ride at Pioneer High, and in the nearby neighborhood. Briggs noted that it ran counter to the city’s efforts to encourage alternative transportation. Those three commissioners voted against the rezoning, but the resolution passed on a 6-3 vote. It will still require city council approval. Also at the March 6 meeting, commissioners postponed action on a request from owners of the Shell service station at the northeast corner of Ann Arbor-Saline and West Eisenhower Parkway. Owners of the station hope to build additions onto the existing 1,000-square-foot convenience store, but planning staff recommended postponement in order to gather additional information and analysis about the plan. Site plans and rezoning for two Main Street parcels owned by the Automobile Club of Michigan – where an AAA branch is currently located – were on the agenda for the March 6 meeting. City planner Alexis DiLeo gave the staff report. The requests relate to 1100 and 1200 S. Main, across from Michigan Stadium. 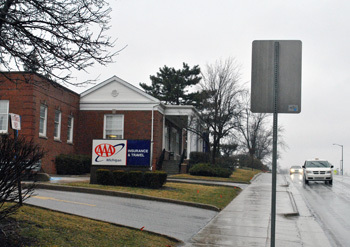 An AAA branch built in the 1950s is located there. The owner wants to build a new branch on a different part of the site, tear down the existing building, and reconfigure parking spaces. The two parcels are part of a 1.5-acre site containing four parcels owned by the auto club and all zoned O (office). Located on the 1200 S. Main parcel is the current one-story branch building with walk-out basement and 36 parking spaces, with exits onto South Main, Berkley and Potter. The 1100 S. Main site is a surface parking lot, which has 72 spaces and exits onto both Potter and Keech. The owner is requesting to build a one-story, 5,443-square-foot new branch building on the northeast corner of that site, with parking for 21 spaces. A second phase of the project would include an eventual 2,230-square-foot addition to the south side of that building. There are six landmark trees on the site, and the plan would require removal of two that are located along South Main, near Keech. Other trees would be added elsewhere on the site. Looking north on Main Street at the AAA Michigan branch in Ann Arbor. After the new structure is completed, the old building at 1200 S. Main would be torn down and a 14-space parking lot would be put on that parcel. To do that, the proposal asks that the northern 123 feet of that parcel – about half of the parcel – be rezoned from O (office) to P (parking), so that parking could become the principal use for that site. A site plan for that parcel is also required. The owner’s overall plan called for a total of 35 spaces – a reduction from the current parking on the site, which was approved in the mid-1970s but is no longer conforming with existing zoning. The 35 spaces would be four more spaces than the 31 maximum number permitted under the O (office) zoning, based on the new building’s square footage in both phases. That’s why the owner requested that a portion of the overall site be rezoned for parking – in the P (parking) district, there is no maximum. Planning staff had previously recommended postponing action on the request, so that the owner could include the possible future addition as part of the site plan, to reflect parking needs better. 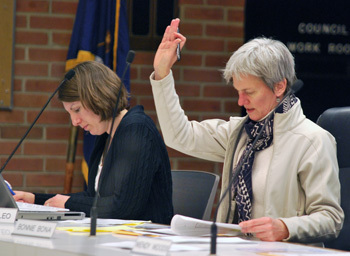 However, because the planning commission did not achieve a quorum for its Feb. 23 meeting, no action was taken. Revised plans were subsequently submitted, and the planning staff recommended approval. One person spoke during the project’s public hearing. Chris Arnold of NSA Architects spoke on behalf of the owners, and said the entire team – including legal counsel, designer, civil engineer and landscape architect – were on hand to answer questions. He said they did a study to see whether to remodel. The existing building has more space than the branch needs, and is configured so that the bottom level is not handicap accessible. The building is also not energy efficient, he said. Meanwhile, the auto club has developed a new brand and image for its offices, so the decision was made to rebuild. Arnold cited several features of the plan, including a reduction of parking from nearly 100 spaces to a proposed 35 – a rather large and significant reduction, he said. The plan will reduce pervious pavement by about 40%, and eliminate curbcuts onto South Main. The building will also target LEED certification, he said. Commissioners had several comments and concerns. This report organizes their discussion thematically. Tony Derezinski said he was curious about the construction phases. When would the second phase be built? He joked that Main Street does have some activity, especially in the fall – an allusion to the Saturday football games at Michigan Stadium, located across the street from the AAA branch. Responding to Derezinski, Alexis DiLeo said that depending on when approval is granted, construction for the first phase would likely begin in late summer or early fall. John Chamberlain, an attorney representing the owner, said there are no plans yet regarding the second phase. It’s not anticipated that the first phase would require any closure of Main Street due to construction. Later in the meeting, Derezinski pressed for more details on the project’s second phase – not having a solid timeframe was a concern to him. Chamberlain said he wished he could be more specific, but it’s unclear when expansion would be appropriate in Ann Arbor. Nationwide, AAA is expanding. In some locations, the company is opening bank branches. There’s one in Dearborn, and the second phase of the Ann Arbor branch could accommodate a bank branch, he said. But their plans are flexible, with no certain schedule at this point. Wendy Woods asked about the portion of the parcel at 1200 S. Main that would not be used for parking. Would the landscaping be upgraded? Chamberlain said the plan calls for turf grass with perimeter landscaping. It would be an increase over the amount of impervious surface at the site now, he said – about 55-60% of the parcel will be grass or landscaping. Evan Pratt asked about the soil type on the site – it’s Miami loam, DiLeo said. Pratt highlighted the fact that a bioswale is proposed on the southern side of 1100 S. Main. Usually, inclusion of a bioswale means that the design relies on water to infiltrate, he said, but there’s also an underground detention chamber on the site. Steve Sorensen, the project’s civil engineer, confirmed that the intent is for water to perc down through the bioswale. There are pervasive water problems along the Allen Creek, Pratt noted, so it’s beneficial to take runoff off-line, out of the city’s stormwater system. He observed that another recent project – a residential development at 618 S. Main – plans to handle all its stormwater runoff on the site, with zero percent added to the stormwater system. The commission liked that approach, he said. Kirk Westphal asked whether other options were considered – such as a “planned project” – instead of rezoning a parcel for parking. Alexis DiLeo indicated that several options had been discussed. The owners originally were seeking a variance for the additional parking. Wendy Rampson, the city’s planning manager, noted that the city’s zoning board of appeals doesn’t have the authority to grant a variance for a use that normally isn’t allowed. Because parking would be considered the principal use for this parcel, she said, the only option was to rezone it for parking. Rampson said the other strategy that was discussed was to keep the existing building or put another development on the site, so that there could be shared parking with the new branch building. The owners looked at that possibility, but decided that their mission wasn’t to create new office space and become a landlord. Rampson noted that in an earlier proposal, the owners had requested that the entire 1200 S. Main parcel be rezoned for parking. But that request had been modified to ask for rezoning only on about half of the parcel. Bonnie Bona, right, was one of three planning commissioners who voted against a proposal to rezone part of the AAA branch parcel from office to parking. To the left is Alexis DiLeo of the city's planning staff. DiLeo explained that a planned project wouldn’t be an option, because it allows only for zoning modifications related to setback and height, not parking. Westphal asked whether this rezoning would complicate future development, if the land changes hands. DiLeo replied that if it’s rezoned as parking, then that’s what the parcel must be used for. If the entire site were to be redeveloped, it would likely have to be rezoned again. Erica Briggs also expressed concern about rezoning for parking, especially given that the site is located on Main Street. It doesn’t seem to be in line with the city’s plans for that area, she said. Bonnie Bona noted that some of the auto club’s parking demand relates to occasional special meetings that are held there. She wondered about the availability of nearby parking in neighborhood streets. Is there any residential pressure that would prevent daytime parking there? All of the side streets in that area – including Keech, Potter and Berkley – have on-street parking, DiLeo said. It’s used to some extent by people who work in downtown Ann Arbor or at the University of Michigan, she added, but not at levels like you’d find in Kerrytown or on the Old West Side. She did note, however, that before the AAA branch added parking in the 1970s, residents complained about the on-street parking situation. John Chamberlain, legal counsel for the auto club, explained that the larger meetings held at the branch were usually marketing- and travel-related, such as information meetings about cruises, for example. Bona said that where she works, when they need to hold a large meeting they find a venue with parking that can accommodate it. Bona also noted that since this AAA site is in an urban setting, alternative methods of getting to work should be encouraged. Is it located on a bus route? she asked. Yes, DiLeo said. Two bus routes emanate from the south stop at the nearby Pioneer High School park-and-ride, then go past the AAA site and into downtown. Diane Giannola asked whether the maximum amount of parking allowed on the site takes into account whether the parking is needed for employees or customers. DiLeo wasn’t sure, but said there are different requirements for retail districts compared to office districts – more parking is allowed for retail. Regarding the possible future AAA bank branch at that location, DiLeo later clarified that financial institutions require between 4.5-5.5 spaces per 1,000 square feet of floor space. That compares to general office use, with a requirement of 3-4 spaces per 1,000 square feet. Referencing the initial phase of the project, Giannola said she understands that the AAA branch is considered an office, but it’s not a typical office – more customers tend to come and go. Wendy Woods asked whether there are restrictions on who can use the AAA parking lot after-hours. No, Chamberlain said, anyone can park there. Woods noted that if UM decides to hold more night games at Michigan Stadium, additional parking in that area might be useful. Chamberlain reported that on football Saturdays, the branch lets a local Boy Scout troop sell parking on the lot and keep the proceeds. That relationship will continue, he said. He asked how long it would take to walk from the Pioneer park-and-ride lot to the AAA branch. About 5-7 minutes, DiLeo estimated. In that case, Westphal said, he’d feel comfortable about possibly deferring action on the extra parking that AAA says it needs for the second phase of its project. Briggs agreed, saying it’s hard to see the need for rezoning part of the parcel for parking. AAA Branch Proposal: Commission Discussion – Parking, Rezoning Deferred? Westphal wondered whether it made sense to consider the rezoning proposal later, but move ahead on the site plans. Would that throw a wrench into the overall project? DiLeo said the rezoning takes longer to move through the approval process, because it requires two readings at city council. If the commission postponed or tabled the rezoning, the site plan for 1200 S. Main couldn’t move forward because the two proposals are linked, she said. On the other hand, even if the commission voted to deny any of the proposals, the owners could still move the project to the city council. It would simply move forward with a recommendation of denial. Wendy Rampson said the reason that planning staff presented three different proposals to vote on was to allow for some flexibility. But if the commission denied a recommendation to rezone the parcel, they should also make it clear that they’re recommending approval only of the first phase of the overall project, she said. That would be the most expeditious way to allow the owners to move forward to the city council. Westhphal explained his main concern: If AAA never moves ahead with its second phase, there will have been no reason to rezone land on Main Street for parking. He didn’t think it was onerous to ask AAA to bring back the rezoning request whenever they’re ready to do the second phase of the building. Giannola reminded commissioners that the current proposal reduces parking on the site significantly from the amount that’s there now. It’s an improvement, she said, so it’s more of a win-win, even if it’s rezoned for parking. Briggs said she agrees 100% that the proposal would be better than the existing site. But there’s never a justification to rezone for parking, she said. Residents pay taxes to support the park-and-ride lots, and the neighborhoods. There is parking capacity in those locations, she said. If AAA ever decides to build the second phase, they can ask for more parking. 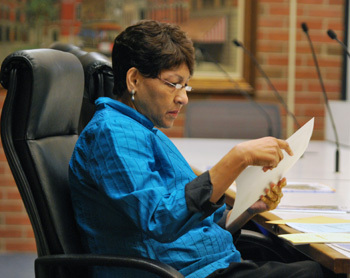 She observed that the current proposal requests rezoning to allow for just four extra spaces. Rampson clarified that the parcel would have to be rezoned for parking no matter how many spaces were actually on it, because without a building there, parking would be its principal use. Bona agreed that the proposal was a huge improvement, “but that doesn’t mean it’s enough improvement.” If the rezoning occurs, Bona said she assumed the owners could leave the existing building in place and use the parking that’s currently there. But could they tear down the building and keep the parking for it? No, DiLeo said, because without a building, parking would become the principal use and it would need to be rezoned. She said the staff had talked to the owners about keeping the current building and renting it out, but AAA doesn’t want to be a landlord, she said. They could leave the building vacant, but they can’t demolish it. Woods said she wasn’t sure it was fair to tell a business to ask clients or employees to park on the neighborhood streets. Then the problem spills over into the neighborhood. She noted that if an office is eventually built on the 1200 S. Main parcel, then a portion of the lot would be used for parking anyway. So she wasn’t sure it was fair to prevent parking on that site now. Giannola agreed with Woods. It’s unfair for the parking to spill into the neighborhoods. And it doesn’t seem necessary, she added, given that the site is being improved. AAA is a special kind of office, and needs more parking than just for employees. It’s important to have temporary parking for customers, she said. Derezinski said he echoed those comments, and added that the building AAA plans to put up is very nice. He objected to making the company return a second time for approval of the next phase, saying that approach is more expensive and therefore would be less likely to happen. Briggs said she was likely beating a dead horse, but that she lived on the city’s west side and didn’t mind when non-residents parked in the neighborhood. It meant there were more “eyes on the street.” If more parking is provided on the site, she said, then of course it will be used. But if the city wants to encourage alternative forms of transportation, like biking and walking, then they need to plan parking accordingly. These goals are stated in several of the city’s planning documents, she concluded, including the transportation plan and non-motorized transportation plan, among others. Outcome: Three separate votes were taken. The vote to recommend rezoning of 1200 S. Main to P (parking) passed on a 6-3 vote, with dissent from Bona, Briggs and Westphal. Those three commissioners also voted against the site plan for 1200 S. Main, but that resolution also passed on a 6-3 vote. The site plan for 1100 S. Main was unanimously approved. The proposal will be forwarded to the city council for approval. Commissioners were asked to consider a plan for a new Noodles & Co. restaurant at 2161 W. Stadium Blvd. – site of the former Sze-Chuan West, a building adjacent to Bell’s Diner and Stadium Hardware. City planner Alexis DiLeo gave the staff report. The proposal calls for demolishing the existing 4,300-square-foot restaurant and building a new 2,679-square-foot one-story restaurant with a 615-square-foot enclosed patio at the front of the building. The 1.15-acre site is located on the west side of West Stadium, south of Liberty. The project would also reconfigure the existing parking lot and provide additional landscaping. The site plan approval would be contingent on a land division request that’s currently being reviewed by the city’s planning staff. The division would separate the restaurant parcel from a larger parcel at 2151 W. Stadium, where the Big M car wash is located. Both parcels are owned by Chuck Gallup of Gallup Properties. Another contingency relates to an easement that allows the site to access West Stadium. Currently, there’s a 10-foot access easement to the north – a shared driveway with 2163-2177 W. Stadium, where the building that houses Bell’s Diner and Stadium Hardware is located. However, the owner of that property is unwilling to expand that easement. Instead, a permanent access easement across the adjacent property to the south – where the Big M car wash is located – will be required. In their staff memo, planning staff noted that the redevelopment is consistent with the city’s master plan and would improve the aesthetics of the West Stadium corridor. The project had originally been on the planning commission’s Feb. 23 meeting agenda, but because commissioners lacked a quorum, no action could be taken and it was rescheduled for the March 6 meeting. Staff had recommended the project for approval. Noodles & Co. operates two other restaurants in Ann Arbor – at 320 S. State, near the University of Michigan campus; and at Arborland on Washtenaw Avenue, on the city’s east side. 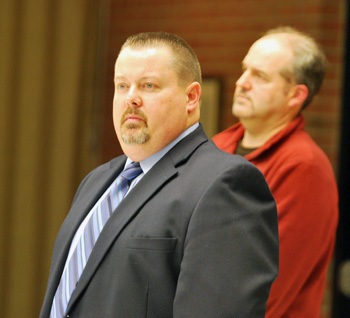 Only one person, Todd Quatro, attended the public hearing – he spoke on behalf of the owner. Quatro said DiLeo’s report covered the highlights of the project. The plan is to demolish the existing building and put up a new one, with additional landscaping, stormwater detention and other features. A new fire hydrant will also be installed, he said. Diane Giannola asked if it’s common to have a parcel with two different types of zoning for the same parcel. [The site at 2161 W. Stadium Blvd. is zoned C3 (fringe commercial) at the front, where the restaurant is located, and C2B (business service district) at the rear.] DiLeo said it’s not a common situation, but it does occur – the AAA branch site is now an example of that, she added. Wendy Woods told Quatro that the pavement between the car wash and the restaurant building is “a little rough.” Quatro replied that it will be repaved, and widened slightly. Bonnie Bona raised the issue of the driveway between the proposed Noodles site and the building to the north. She noted that driveway is wide and people were accustomed to parking next to the restaurant, but all the parking spaces for the new restaurant will be in the back. The excess pavement in the driveway might attract parking, and create a problem, she said. Quatro said communication has been difficult with the property owner to the north. [City records show the property is owned by Renken Associates. Duane Renken, the firm's president, had sent a letter to the city planning staff stating that an access easement would not be expanded or modified.] A meeting is scheduled next week with the owner to talk about the construction sequence, Quatro said, and he hoped that would open a little conversation between the parties. Wendy Rampson, the city’s planning manager, also indicated that the staff were somewhat frustrated about the lack of communication, and hoped that the meeting would improve the situation. Outcome: Commissioners unanimously recommended approval of a site plan for a new Noodles & Co. restaurant at 2161 W. Stadium Blvd. The recommendation will be forwarded to the city council for consideration. A site plan for a new Tim Hortons at 3965 S. State St. was on the agenda for the March 6 meeting. The site is located on the east side of the street, near the intersection of State and Ellsworth. 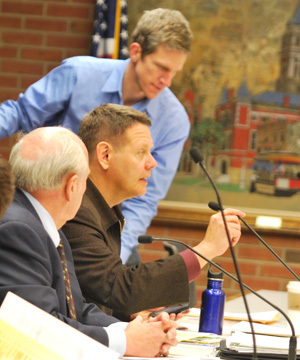 Mark Kellenberger, a representative of Tim Hortons, addressed the March 6 meeting of the Ann Arbor planning commission. In the background is Dave Dykman, a project manager with the city, who was on hand to answer questions about a roundabout planned for the intersection of South State and Ellsworth, near the proposed Tim Hortons site. City planner Chris Cheng gave the staff report. 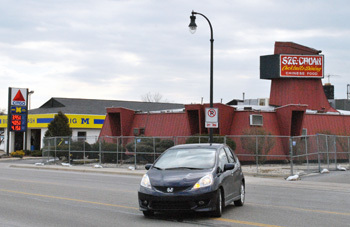 The plan calls for demolishing a vacant building on the 2.23-acre site where previous restaurants, including Enzo’s and Gallagher’s, were located. In its place, a one-story 1,953-square-foot restaurant with a single-lane drive-thru would be built on a 1.18-acre site divided from the current parcel. An outdoor seating area is proposed on the east side of the building. The building would face West Ellsworth and use an existing shared drive on South State, as well as a relocated drive onto West Ellsworth, which will be shifted to the east. The property is zoned C3 (fringe commercial), which allows for construction of a drive-thru restaurant. The planning commission’s recommendation would be contingent on two issues: (1) submission of a tree health evaluation form, and (2) approval of the parcel’s land division, prior to the city’s issuance of permits for construction of the new building. Cheng noted that some aspects of the proposed drive-thru don’t conform with draft amendments to Chapter 59 of the city code, which the commission had voted to recommend at its Dec. 6, 2011 meeting and which were given initial approval by city council at their March 5 meeting. The Tim Hortons proposal includes a 5-foot-wide pedestrian link from the Ellsworth sidewalk to the outdoor seating area – crossing the drive-thru lane. But the link is not raised, and no bollards are proposed at each corner to alert drivers to the pedestrian crossing – both of these measures would be required by the code, if the council gives final approval to the amendments. Cheng said Tim Hortons is open to making changes in the color or materials of this sidewalk link, and to placing two bollards at the south side corners. Much of the discussion among commissioners focused on the proposed roundabout at State and Ellsworth, which Cheng described as a “fluid situation.” He noted that the plan at this point calls for an 8-foot-wide nonmotorized path along the north side of Ellsworth, approaching State and adjacent to the Tim Hortons site. Mark Kellenberger, representing Tim Hortons, was the only speaker during a public hearing on the project. He said they’d found out about the roundabout plans late in the process, but are working to integrate their own plans to accommodate it. He indicated that if the company gets approval from the city, Tim Hortons hopes to open the location this August. 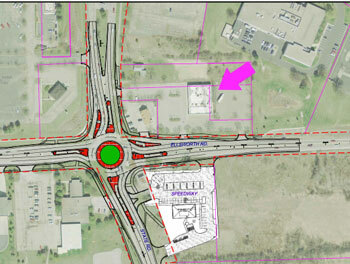 Construction for the roundabout is expected to begin in the spring of 2013, with completion in the fall of that year. To put the roundabout issue in context, The Chronicle attended a Feb. 29, 2012 public forum about the project at Pittsfield Township Hall. The effort is a collaboration of the Washtenaw County road commission, Pittsfield Township and the city of Ann Arbor. Project manager Mark McCulloch told the crowded forum that the project is being driven in large part by the new Costco store, which is expected to open this summer just northwest of State and Ellsworth. That store will add traffic to the already congested intersection. The roundabout would be funded by a $1.4 million federal grant from the Congestion Mitigation and Air Quality Improvement (CMAQ) program. Costco also plans to contribute $500,000. Building a roundabout is seen as a better alternative to accommodate increased traffic flow than widening the roads. There are a few roundabouts within the city of Ann Arbor, including at the intersections of Huron Parkway and Nixon Road, Maple and M-14, and Geddes and US-23. The latter two were built in partnership with the Michgan Dept. of Transportation, which handles major trunklines through the city. Outside of the city, the road commission oversees road construction, and is handling the Ellsworth and South State roundabout. It previously built a roundabout in Ypsilanti Township, on Whittaker Road at Stony Creek Road. Looking south on South State Street, at the intersection of State and Ellsworth. The Feb. 29 forum included opportunity for questions and comments, and while some people supported the roundabout, many expressed a general dislike for the approach, based on their personal experiences and on concerns about its effectiveness. One resident asked how the roundabout would deal with 100,000 people on a football Saturday, for example. He said when he encountered a roundabout in Ontario, he was at a standstill for five minutes because he could not change lanes. Some residents were concerned about how the roundabout will affect people using the Pittsfield Township senior center, which is located at the southwest corner of State and Ellsworth. One woman who spoke said she was an employee at the center, and asked if there would be information circulated to senior citizens. She said that understanding the project is crucial “to ease their worries, which will make them less scared.” McCulloch said he indicated he’d be willing to do both formal and informal Q&A sessions with seniors in the future. Another concern raised at the forum related to the roundabout’s design. One man said he had used roundabouts for many years, having traveled in Asia, Europe, and South America. “The concept is good,” he said, “but size is the problem.” He argued that the proposed roundabout was too small. McCulloch replied that “we’ve tried to find a balance point.” A small roundabout means that vehicles will travel at a lower speed, which is good for safety. A roundabout that’s too large could be more dangerous, he said. Another man also argued that the project was much too small. He asked if any thought had been given to widening Ellsworth. McCulloch said the road commission had “no jurisdiction over the city of Ann Arbor.” Ellsworth is located within the city. She asked if she could circulate a petition. McCulloch answered that she could do that, but he indicated that he couldn’t promise any change in the plans. At the March 6 planning commission meeting, Tony Derezinski asked whether the ingress and egress from this site has potential to conflict with the proposed roundabout at State and Ellsworth, especially during busy times of day. Dave Dykman, a project manager with the city, told commissioners that a consultant team is looking at that issue now, particularly the access onto South State. They’re looking at the possibility of allowing only right turns out of the site, he said. They might also put in a northbound-to-southbound crossover in the median on State north of the intersection, which would allow cars going northbound on State to access the southbound lane. Now, there’s a southbound-to-northbound crossover on State just south of the Research Park intersection. Making lefthand turns out of the Tim Hortons site wouldn’t work, he said. Dykman also said a short left turn lane from southbound South State is being considered for the turn into the Tim Hortons site. Mark Kellenberger, the representative from Tim Hortons, said the last thing he wants to do is build a Tim Hortons on the site and have it functionally obsolete as soon as the roundabout is built. Although the business has other locations in this area, the location at State and Ellsworth will be the first free-standing Tim Hortons in Ann Arbor. 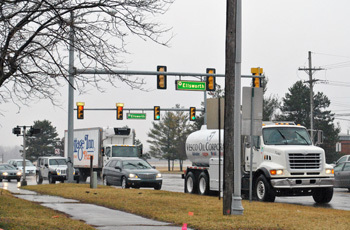 They’ve been working with the county road commission to get the most updated roundabout plans and respond to those in the design, Kellenberger said. That’s their goal. Diane Giannola noted that other roundabouts in the city don’t have businesses nearby. She wondered if it’s unusual to have a business near a roundabout. Dykman replied that it’s common in other parts of the country. He noted that one community in Indiana has more than 60 roundabouts. [That town is Carmel, a northern suburb of Indianapolis. A report on Carmel's roundabouts aired last year on CNN's Anderson Cooper 360.] A roundabout at State and Ellsworth will significantly improve traffic at that intersection, Dykman said. Wendy Woods asked about the timeline for building the roundabout. The tentative start date for construction is in the spring of 2013, Dykman said, with completion in September of that year. Kirk Westphal said it’s great that the company is adhering to requirements that are not yet in place, referring to the Chapter 59 amendments to the city code. He wondered whether a raised crossing would be possible, and asked if it could be designed with slope that’s gentle enough not to cause drivers to spill their coffee. From left: planning commissioners Tony Derezinski, Evan Pratt, and Kirk Westphal. Mark Kellenberger with Tim Hortons said the design is somewhat limited by where the patio area is located. The crossing from the Ellsworth sidewalk to the patio is only about 13 feet, so it’s not far to cross, he said. They’ve discussed striping it and putting in bollards, but not raising it. Bonnie Bona suggested using something textural for the sidewalk, like brick or stamped asphalt. The Starbucks on Washtenaw has a pedestrian crossing that works well, she said. Painting stripes tends to look out of scale for pedestrians, she observed – it’s as though the stripes are sized for a semi-truck. Erica Briggs wondered if there was an pedestrian walkway planned from South State into the site. Cheng replied that there are sidewalks along State, and the Tim Hortons building will have bike hoops and a bike locker. But there isn’t a pedestrian path from State to the building. So if someone were walking along State and wanted to go to Tim Hortons, Briggs asked, they’d need to walk along the driveway into the site? Yes, Cheng said. Briggs asked if any accommodation could be made to separate the drive from a place for pedestrians to enter. Kellenberger said he wasn’t sure how they’d do that, given the amount of room they have to work with and the landscaping that would be required. Wendy Woods asked about the number of cars that the drive-thru is designed to accommodate – a queue of 11 vehicles. That seemed like a lot, she said. If she saw 11 cars in the line, that would be a disincentive for her to stop in. Kellenberger said Tim Hortons prides itself on quality and fast service. You might be the 10th car in line, but it would only take a couple of minutes before you’re served, he said. Derezinski asked about plans he’d heard for Tim Hortons in other locations. He recalled approving a plan for a Tim Hortons at the intersection of Washtenaw and Huron Parkway a few years ago, but that project never materialized. Kellenberger said that project didn’t work out for a variety of reasons. In response to another query from Derezinski, Kellenberger said the timeline for construction is to begin in early May, assuming approvals and permits are received from the city. That could lead to an August 2012 opening, he said. He told Derezinski the shop is expected to be open 24 hours daily – that’s what the business is proposing. Outcome: Commissioners voted unanimously to recommend the site plan for a Tim Hortons shop at 3965 S. State, near Ellsworth. The recommendation will be forwarded to the city council. Commissioners were asked to consider a request regarding the Shell service station at the northeast corner of Ann Arbor-Saline and West Eisenhower Parkway. City planner Chris Cheng gave the staff report. Owners of the station are asking for revisions to the site’s planned unit development (PUD), which would allow them to build additions onto the existing 1,000-square-foot convenience store. The new additions would total 4,089 square feet, including 2,189 square feet to the north and east of the store. Their plan also calls for converting the 900-square-foot carwash area into new retail space. The existing access drive to the carwash would be landscaped, and the parking lot would be reconfigured for a new total of 16 spaces. Cheng noted that although the current plan shows a proposed cut-through between the site and the adjacent Cranbrook Shopping Center, the grade change is too steep between the two parcels, and that part of the plan will be removed. Planning staff had recommended postponement because additional information and analysis was required, including: (1) a trip-generation evaluation, with a statement on the impact to the adjacent intersection (West Eisenhower and Ann Arbor-Saline); and (2) an evaluation of sewer flow data comparing the proposed flow (as a result of this project) to the existing flow. If the proposed flow is greater than the existing flow, the increased flow must be mitigated. In addition, planning staff are writing an amendment to the PUD’s current development agreement to remove limitations on uses allowed at the site. Instead, the limitations would be handled in supplemental regulations to the PUD. No one spoke during a public hearing on the proposal. Evan Pratt noted that commissioners had provided feedback at a Dec. 13, 2011 working session, before the owners submitted this proposal. He wondered if that feedback had been incorporated into the proposal. Wendy Rampson, head of the city’s planning staff, suggested that commissioners review changes in the PUD’s supplemental regulations. Planning staff had drafted some design guidelines for the site, to provide direction for future development. It would be helpful for commissioners to provide feedback on that draft, she said. [.pdf of supplemental regulations] Beyond that, there haven’t been any changes since that December session. Bonnie Bona noted that she’d asked that accommodations be made in the plan for the location of propane tanks and ice chests. If those are located in front of the building, access ramps would be blocked. Erica Briggs wondered why vehicle access between the site and Cranbrook Shopping Center is no longer included. Cheng said there’s a severe drop between the Shell site and Cranbrook, and a cut-through wouldn’t be possible, given the grade. Briggs asked whether a pedestrian passage could be built. Cheng agreed to explore that possibility, but noted that it would likely require steps. Outcome: Commissioners voted unanimously to postpone the request for PUD revisions for the Shell service station at Ann Arbor-Saline and West Eisenhower Parkway. Present: Eleanore Adenekan, Bonnie Bona, Erica Briggs, Tony Derezinski, Diane Giannola, Eric Mahler, Evan Pratt, Kirk Westphal, Wendy Woods. Chronicle intern Hayley Byrnes contributed to this report. The Chronicle relies in part on regular voluntary subscriptions to support our coverage of public bodies like the city planning commission. If you’re already supporting The Chronicle, please encourage your friends, neighbors and coworkers to do the same. Click this link for details: Subscribe to The Chronicle. Pedestrian access to Tim Horton would be nice, but State where it crosses I-94 has been closed to pedestrians since the 1970s. Is there any plan to re-open it?